Where is blue light found? Where is the increased exposure to blue light coming from? What are the effects of blue light exposure on our health? We all know how important it is to protect our eyes from the sun's harmful UV rays; but what about the harmful effects of blue light rays? How many hours do you spend in front of a digital screen? Most of us spend the majority of our waking hours staring at a digital screen. Studies suggest that 60% of people spend more than 6 hours a day in front of a digital device. spectrum" that can be seen by the human eye. 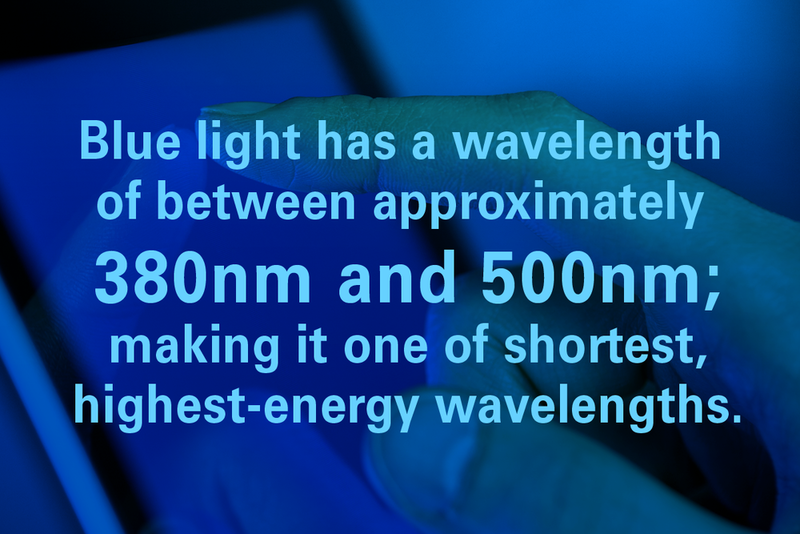 Blue light has a wavelength of between approximately 380nm and 500nm; making it one of the shortest, highest-energy wavelengths. Blue light is actually everywhere. Blue light is actually everywhere. 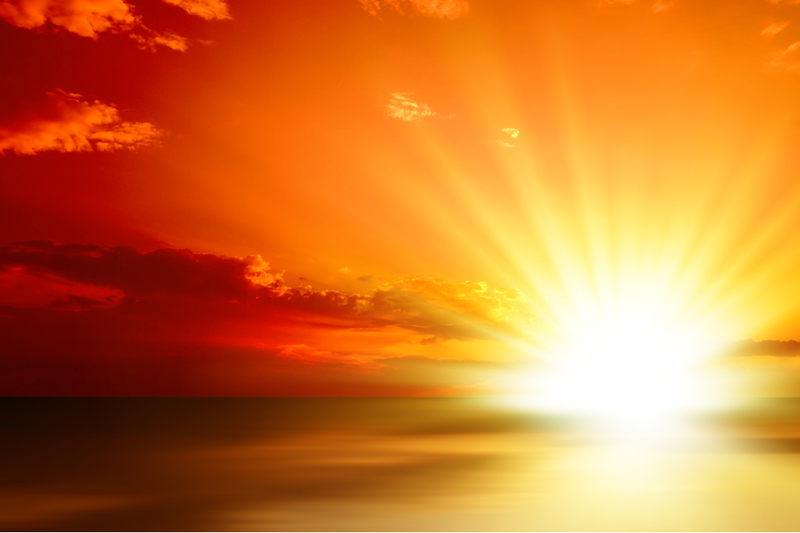 When outside, light from the sun travels through the atmosphere. The shorter, high energy blue wavelengths collide with the air molecules causing blue light to scatter everywhere. This is what makes the sky look blue. In its natural form, your body uses blue light from the sun to regulate your natural sleep and wake cycles. This is known as your circadian rhythm. Blue light also helps boost alertness, heighten reaction times, elevate moods, and increase the feeling of well being. Artificial sources of blue light include electronic devices such as cell phones and laptop computers, as well as energy-efficient fluorescent bulbs and LED lights. Why should we be concerned about blue light exposure? Blue light waves are the among the shortest, highest energy wavelengths in the visible light spectrum. Because they are shorter, these "Blue" or High Energy Visible (HEV) wavelengths flicker more easily than longer, weaker wavelengths. This kind of flickering creates a glare that can reduce visual contrast and affect sharpness and clarity. This flickering and glaring may be one of the reasons for eyestrain, headaches, physical and mental fatigue caused by many hours sitting in front of a computer screen or other electronic device. Our eyes' natural filters do not provide sufficient protection against blue light rays from the sun, let alone the blue light emanating from these devices or from blue light emitted from fluorescent-light tubes. Prolonged exposure to blue light may cause retinal damage and contribute to age-related macular degeneration, which can lead to loss of vision. The evolution in digital screen technology has advanced dramatically over the years, and many of today's electronic devices use LED back-light technology to help enhance screen brightness and clarity. These LEDs emit very strong blue light waves. Cell phones, computers, tablets and flat-screen televisions are just among a few of the devices that use this technology. 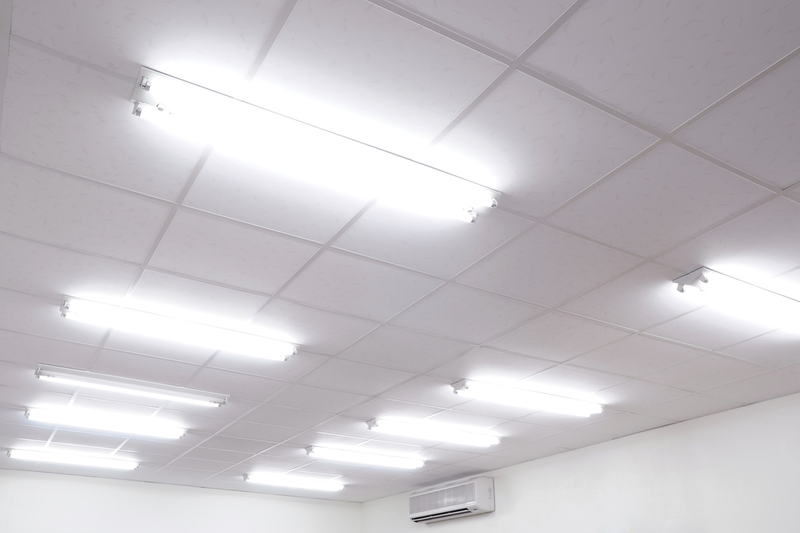 Because of their wide-spread use and increasing popularity, we are gradually being exposed to more and more sources of blue light and for longer periods of time. Spending just two consecutive hours on a digital device can cause eyestrain and fatigue. Most of us spend the majority of our waking hours staring at a digital screen. Blue light has been known to cause flickering and glaring. Strain is often caused by the distance between the eyes and a digital screen. Blue light can help elevate your mood and boost awareness, but chronic exposure to blue light at night can lower the production of melatonin, the hormone that regulates sleep, and disrupt your circadian rhythm. Researchers aren't exactly sure why exposure to blue light at night seems to have such detrimental effects on our health, but it is known that exposure to light suppresses the secretion of melatonin and lower melatonin levels might explain the association with these types of health problems. 74% of teens aged 12-17 access the internet on cell phones, tablets, and other mobile devices at least occasionally. In two American surveys of children aged 12 to 15 years released in July 2014, researchers at the U.S. Centers for Disease Control and Prevention found that nearly three-quarters spent at least two hours a day watching TV and using a computer. The surveys also found that 15 percent of teens watch four or more hours of TV daily, while nearly 12 percent report using their computers for four or more hours a day. The surveys didn't ask teens about their use of smartphones. Dr. Marjorie Hogan, a pediatrician who helped write the American Academy of Pediatrics guidelines on kids' screen time, recognizes parents have a tough task limiting TV and computers for kids in that 12 to 15 age range - especially in the age of social media. Most of us spend the majority of our waking hours staring at digital screen, whether it's the computer at work, our personal cell phone, playing a video game, or just relaxing and watching TV. Digital eyestrain is a new term used to describe the conditions resulting from the use of today's popular electronic gadgets. Digital eyestrain is a medical issue with serious symptoms that can affect learning and work productivity. Symptoms of digital eyestrain, or computer vision syndrome, include blurry vision, difficulty focusing, dry and irritated eyes, headaches, neck and back pain. Digital eyestrain has overtaken carpal-tunnel syndrome as the number one computer-related complaint. Digital eyestrain does not just affect adults. Children are also at risk for eyestrain due to their growing use of digital devices. Children today have more digital tools at their disposal than ever before – tablets, smart phones, e-readers, videogames are just among a few. According to a study by the Kaiser family Foundation, children and teenagers (ages 8-18) spend more than 7 hours a day consuming electronic media. Before age 10, children's eyes are not fully developed. The crystalline lens and cornea are still largely transparent and overexposed to light, so too much exposure to blue light is not a good thing. Parents should supervise and limit the amount of screen time their children are permitted. Nearly 70% of adults who report regular usage of media devices experienced some symptoms of digital eyestrain, but many did nothing to lessen their discomfort mainly due to lack of knowledge. 93% of teens have a computer or have access to one. There's growing medical evidence that blue light exposure may cause permanent eye damage; contribute to the destruction of the cells in the center of the retina; and play a role in causing age-related macular degeneration, which can lead to vision loss. Melanin is the substance in the skin, hair, and eyes that absorbs harmful UV and blue light rays. It's the body's natural sunscreen protection. Higher amounts of melanin afford greater protection, but as we age we lose melanin, so that by age 65 half of the protection is gone making us more susceptible to eye disease such as macular degeneration. 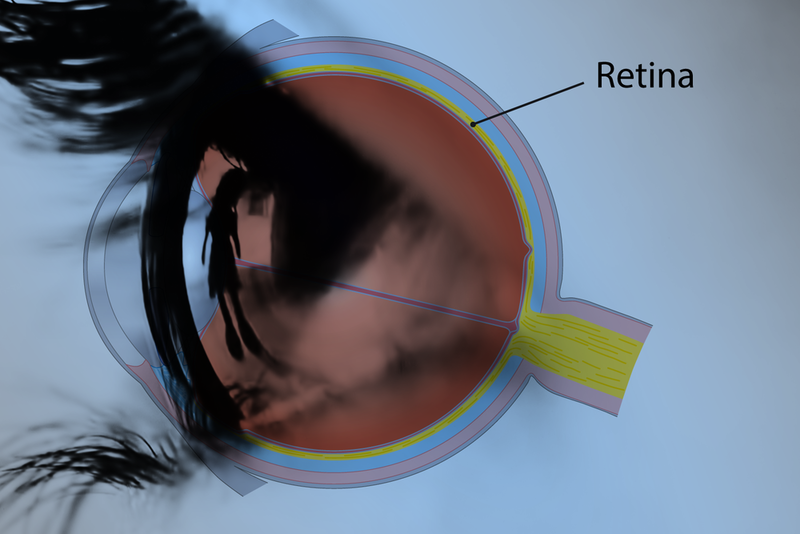 The retina is a very thin, multi-layered tissue covering the inner eyeball. 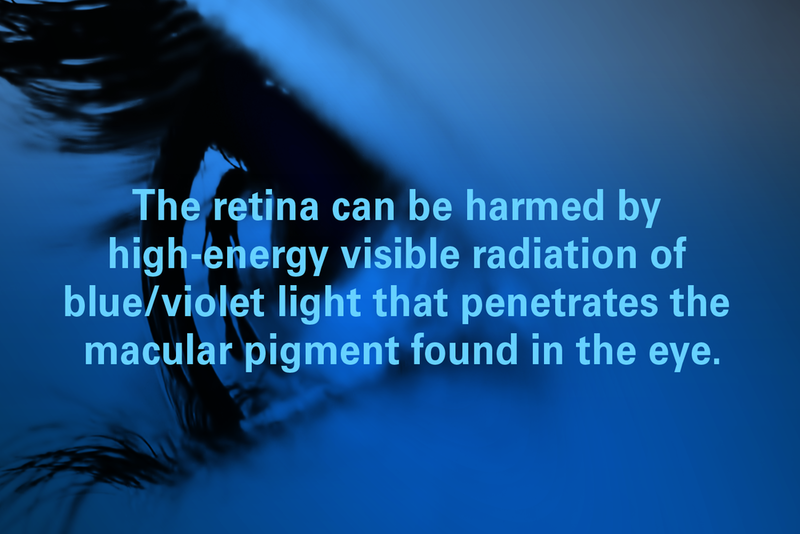 The retina can be harmed by high-energy visible radiation of blue/violet light that penetrates the macular pigment found in the eye. A low macular pigment density may represent a risk factor for age-related macular degeneration by permitting greater blue light damage to the retina. A Harvard medical study states that "High Energy Visible (HEV) blue light has been identified for years as the most dangerous light for the retina. After chronic exposure, one can expect to see long range growth in the number of macular degenerations, glaucomas, and retinal degenerative diseases". And a paper published by the American Macular Degeneration Foundation (AMDF) reports that "the blue rays of the spectrum seem to accelerate age-related macular degeneration (AMD) more than any other rays in the spectrum". Who needs protection from blue light exposure? We all do. Everyone needs to take precautions against the effects of blue light. Whether we work in an office or play in the sun; spend hours staring at a computer screen or texting on our cell phones, we are all being exposed to blue light. Remind yourself to blink more often. Staring at a digital screen can affect the number of times you blink, causing eyes to dry. Those who smoke are up to 4 times more likely to go blind in old age. If you are a smoker, make a New Year's resolution to kick the habit. Changing your digital devices background colour from bright white to cool gray is a simple tip to reduce digital eyestrain.